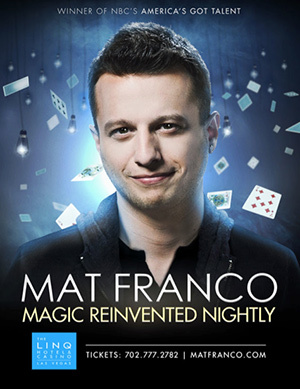 For the first-ever Las Vegas headlining residency, Season 9 winner of America’s Got Talent Mat Franco takes the stage at the LINQ Hotel & Casino and offers a fresh, fun, and feel-good twist on magic that defies all expectations. In a full-scale production built on brand-new, never-before-seen material, the 26-year-old magician delivers his most spectacular performance yet- but still keeps his love of getting up close with the crowd at the heart of every show. With his signature brand of breezy humor, Mat mixes his amazingly inventive and always stunning magic with crowd-guided improve to create a once-in-a-lifetime adventure that’s completely unique to each audience and entirely unforgettable. See more at the Mat Franco website.